AllegroMedical.com presents The Baseline® Hhd To Mmt Combo - Standard Hhd With Push Attachments. Baseline® hydraulic hand dynamometer gives accurate grip strength readings without the subject being able to "feel" the handle move. The internationally accepted design ensures reliability, user convenience and measurement repeatability. Maximum reading remains until the unit is reset. Five position handle and body design yield results that are consistent with published Baseline® and Jamar® studies. The strength reading can be viewed as pounds or kilograms. CE Certified. Comes in a protective carrying case. 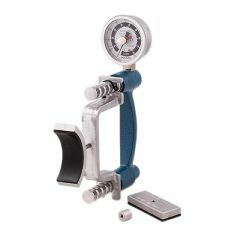 Use the HHD to MMT handle to convert ANY hydraulic grip strength (hand) dynamometer to a MMT (Manual Muscle Test) dynamometer. MMT handle comes with 3 push pads: straight, curved and small circular. Use optional dual-grip handle to stabilize MMT dynamometer during test procedure (sold separately). Kit comes with Baseline® standard hydraulic hand dynamometer. Baseline® standard hydraulic hand dynamometer has a 200 pound capacity. Unit has blue body and 2-1/2” analog gauge. Unit has 2 year manufacturer’s warranty. Baseline® hydraulic hand dynamometer gives accurate grip strength readings without the subject being able to "feel" the handle move. The internationally accepted design ensures reliability, user convenience and measurement repeatability. Maximum reading remains until the unit is reset. Five position handle and body design yield results that are consistent with published Baseline® and Jamar® studies. The strength reading can be viewed as pounds or kilograms. CE Certified. Comes in a protective carrying case.